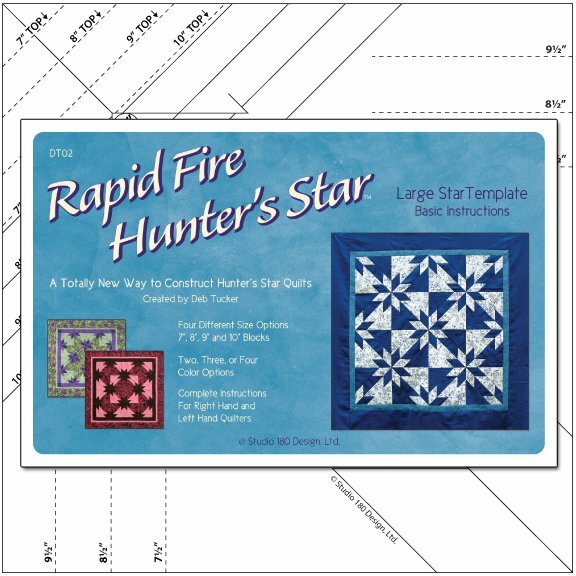 A larger version of the Petite Star tool, this ruler uses the same easy strip piecing steps and same accurate trim down processes, but it results in blocks more appropriate for those larger quilt projects. The tool includes step by step illustrated instructions, charts for future projects, and a “basic recipe” included to get quilters started on their first set of 16 blocks. The Large Star ruler makes the star points larger than those made with the Petite Star ruler thus giving those 7” and 8” blocks a slightly different look from blocks made with the Petite Star tool. So if full size quilts (twin, queen and king) are your passion, this is the tool that will help you make them quicker, more accurately and with much less stress!